A Brockley charity staged their largest Christmas market to date, attracting crowds of over 800 festive shoppers. The local charity, Brockley Cross Action Group, celebrated their fifth year of hosting a market on Coulgate Street in Brockley today. 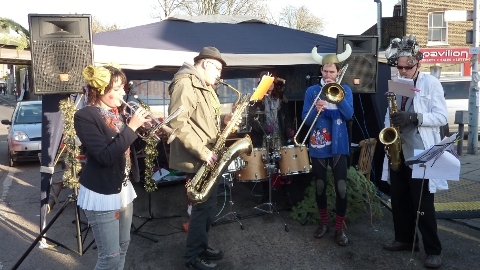 The community-event, organised by a group of enthusiastic volunteers, was a hub of festive cheer, with over 40 stalls showcasing Brockley’s businesses, musicians and artists. The market did not fall short of things to buy, with stalls displaying jewellery, Christmas cards and decorations, vintage clothing, children’s toys, mulled wine, cakes, jams, and much more. As locals surveyed the stalls for Christmas treats, a group of local musicians accompanied the shoppers with festive tunes. Performers included: The Brockley Ukelele Group, The Strum Pets, The Gray Cats, Fruitful Earth, Les Zoings, as well as children from the John Stainer School choir. It is the first time local music group, Les Zoings have played at the market. 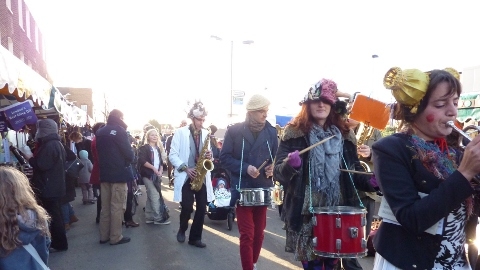 The dressed band paraded through the market playing their first piece. As the market began to draw to a close, Santa made a special appearance and turned on Brockley Common’s Christmas tree lights.